Impact Q&A is our new series featuring insights from our CASE Advisory Council from their leadership in the social impact field. Download a printable version of Laura’s interview. Laura Callanan’s career has brought together social innovation, impact investing and the arts. She started working as a theater intern when she was 16, majored in theater in college, but shifted to Wall Street after graduate school. She has managed the endowment for The Rockefeller Foundation, advised some of the largest global foundations as a consultant at McKinsey & Company, and most recently served as the senior deputy chair for the National Endowment for the Arts. Five years ago, Laura keynoted Duke’s Sustainable Business and Social Impact conference where she introduced the idea of artists as social entrepreneurs. That keynote started her on the path to what would become Upstart Co-Lab. Watch Laura Callanan’s SBSI Talk, “Creativity and the SDGs“, from SBSI 2017.Upstart Co-Lab is a national collaboration connecting artists, impact investors, and social entrepreneurs to create opportunities for artist innovators to deliver social impact at scale. The Chronicle of Philanthropy calls Upstart “an unorthodox idea to give philanthropy more power to do good” (here). Upstart recognizes that artists are a powerful force for change. Not only are artists innovators but they are an economic engine. 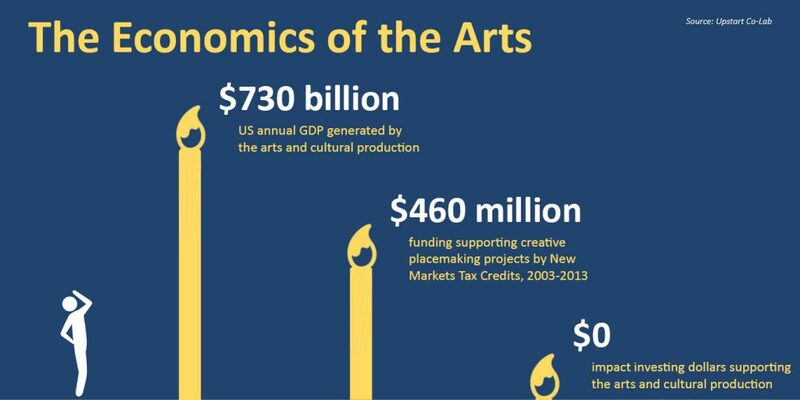 More than $730 billion of US annual GDP is generated by arts and cultural production. And for decades, creativity has been a part of community development. According to Callanan, when the Treasury Department’s CDFI Fund reviewed their investments, they found that $460 million in New Markets Tax Credits supported creative placemaking projects from 2003-2014. But creative places and businesses have gone unnoticed as a segment driving jobs and opportunities in low income communities. According to the Global Impact Investing Network, arts and culture make up 0% of impact investing. Why? Because there are no dedicated investment products or funds that allow investors to direct their impact capital to the creative economy. So Laura set out to change that. I had the chance to sit down with Laura, a member of CASE’s Advisory Council, to get her insights on impact investing in the creative economy, critical trends, and her advice for social entrepreneurs. Tell us more about Upstart being a “Co-Lab” and why you made that decision? Upstart was inspired by the African proverb of “faster alone, farther together.” We are a bridge-builder, connecting artists, impact investors and social entrepreneurs. We do all our work with strategic partners. We didn’t want to set up yet another intermediary, or build a parallel system. All the tools, standards and networks that already exist for impact investing can be tweaked and redeployed for the arts and creativity. This is a collaboration, but it’s also an experiment. We are provoking community development lenders and impact investment managers to focus on the creative economy. If we succeed, the system will shift, and Upstart won’t be needed. That’s why we are set up as a fiscally-sponsored project of Rockefeller Philanthropy Advisors, rather than a separate non-profit. We gave ourselves a three-year timeframe to push the big idea, and implement a portfolio of four projects. Part of your work is to change perceptions about the arts. What is your response when arts are described as “nice to have,” not a necessity? Artists have always contributed to advancing social change. At Upstart, we focus on artists engaged in what’s called a “social practice.” There are artists focused on the environment, on reforming the criminal justice system, on building stronger civic participation, on dealing with racial inequity, on promoting healthy food. Artists can take their skills, techniques and perspectives and bring them into communities, start B Corporations, work like social entrepreneurs. They’re just using a different set of tools than social entrepreneurs with an MBA. Can you give an example of an artist having impact? Theaster Gates is an award-winning artist who has exhibited and performed all over the world. He is also a community leader. 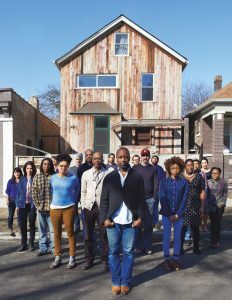 Theaster buys abandoned neighborhood buildings and turns them into community arts centers, using the transformative power of art to revitalize the South Side of Chicago. He is scaling his work around the U.S. through the Rebuild Foundation, a non-profit that revitalizes culture in underinvested communities, and Place Lab, a think-and-do tank dedicated to mindful urban transformation for equitable lives and livable cities. There are also examples of artists founding B Corporations: Matt Stinchcomb was a professional rock musician before helping to start Etsy, Jeni Britton Bauer was a painter before becoming founder and CEO of Jeni’s Splendid Ice Cream, and Kickstarter founder Perry Chen is both a musician and visual artist. Is there an urgency to this work? Why now? I do feel a sense of urgency. More individuals are turning to impact investing and more foundations are breaking the wall between grant making and investing. But there are no impact investing products to allow them to deploy capital to the creativity economy. The creative economy is our future in the U.S. If we want to shape a creative economy that is inclusive, equitable and sustainable, then we need values-based capital in the mix. And we face a different type of urgency with what’s happening in Washington. As budget cuts threaten programs for the environment, education, and community development, impact investors are responding, using the market as an alternative to government to bring social programs to scale. What are you most proud of related to Upstart’s current work? Our launch event last year was at the Ford Foundation, co-hosted by Ford president Darren Walker and cellist Yo-Yo Ma. We invited 85 artists, investors and innovators for a day-long conversation about the artist as social entrepreneur. 25 venture capitalist and impact investors spent their whole day talking about art and creativity. Everyone was deeply engaged and it proved to us that we could build a bridge between these communities. I’m also proud of our first pilot which closed in November. It proved that the impact investing products already in the ecosystem can be used for the creative economy. Upstart connected an impact investor Lorrie Meyercord (who had been searching for an opportunity to deploy capital to the arts and creativity) with the Calvert Foundation. Lorrie invested $1 million in Calvert Foundation’s Community Investment Note and $200,000 in sub-debt, targeting her capital to Artspace, a nonprofit developer of affordable housing for artists. Since Calvert Foundation closed the loan to Artspace (with a total loan amount $2.5 million), Upstart has brought five more individual impact investors and one foundation who together have invested another $500,000 in the Community Investment Note. We are now talking with other community development investment funds about how their existing note products and fund offerings can be used to target capital to creative places and businesses. You’ve played many leading roles across the social sector, what do you see as the most important trend that social impact leaders should be paying attention to? We need to keep our antenna up for the unintended negative consequences. Impact investing is a good thing. Foundations using their endowments towards their mission is a good thing. But what happens if everyone starts to say, I’m going to have my impact ONLY through my investment portfolio. What about all the important things in our society that are not investable? There will always be priorities that you can’t use the market to scale. There will always be a role for government and philanthropy. We need to be sure our priorities dictate how we use our tools. The tools we have should not limit our social and environmental priorities. What is one skill social impact leaders must have to be successful? I think they have to be bridge builders. I was talking with CASE alumna Beth Bafford a few years ago and she observed how the advice given to nonprofits and to businesses is to specialize. Stick to your knitting. No mission creep. Pick something and be the best at it. But the result is we end up with many islands of specialization. There’s got to be somebody out there who’s building the bridge between all the islands. Connecting worlds that don’t usually connect has been a big part of my own career. I think that the social impact leader needs to be constantly making connections, because those connections yield new ideas and new collaborations. Knowing what you know now, what is your advice for social entrepreneurs? Develop a set of trusted advisers. People who know you well, and you know are on your side. That way even if they’re having to say something that’s difficult to hear, you respect their opinions and believe they have your best interests at heart. Once you have these advisers, don’t be shy about engaging them. The second piece of advice is to trust your intuition. Because your intuition is what got you started. It’s what allowed you to identify the issue that you are passionate about. And then you need to find a way to balance both of these: taking feedback from people you trust AND knowing when to stick to your intuition. Find the non-negotiable core elements of your mission, keep coming back to that, and be brave about it. If you could change one thing in the social impact space, what would it be? There needs to be a place to take a new idea. Philanthropy is supposed to be the R&D capital for social change. But you go to a foundation program officer with a truly new idea, they tell you it’s not in their strategy. If it’s truly a new idea, it’s not going to already be contemplated in a foundation’s 5 year strategic plan. It’s just not. There needs to be a way to support new, truly disruptive social change ideas and put significant resources behind them.